It all happened in less than five minutes. The Loudoun County School Board adopted its $1.13 billion operating budget for next fiscal year Monday evening. In a unanimous vote of those present, the board cut $5.5 million from the spending plan it had adopted in January. 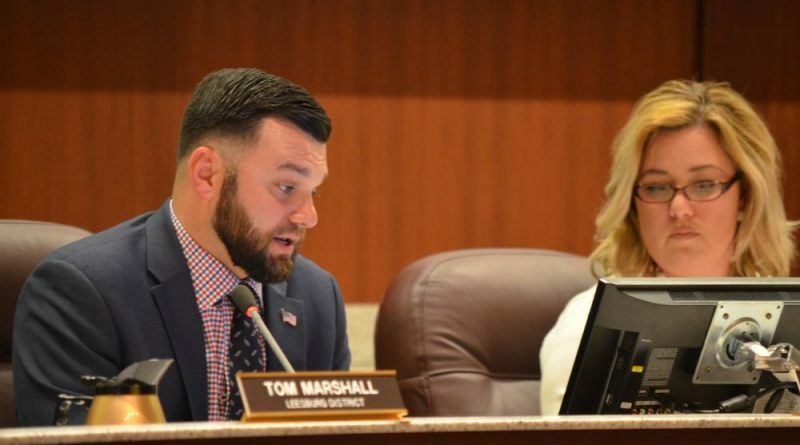 Public school funding approved by the Board of Supervisors came to a 7.7 percent single-year increase, but it still fell $5.5 million short of the School Board’s request. Last week, Superintendent Eric Williams laid out his list of items he recommended the School Board nix first. The board agreed to all except one of the line-item recommendations. In a motion made by Eric Hornberger (Ashburn), the board voted to keep the 2 percent stipend increase, and find that $120,600 in savings by reducing the budget for school-based furniture. Williams’ list included 15 reductions, some as small as $28,000 for fleet fuel and maintenance and $87,584 for part-time staff aides for School Board members, and others as much as $1.7 million to forgo replacing security cameras. But some of the reductions will be covered by unspent funds from the current fiscal year, including the cameras. Other reductions included $300,000 in equipment, such as mowers; $250,000 to outsource transportation for special needs students; $250,000 for bus fuel; $150,000 for high school summer school; and $115,000 for bus maintenance. Another $1.25 million in savings comes from no longer needing a one-week pay supplement to cover checks for 12-month classified employees amid pay roll changes. The finance department came up with an alternate solution, Williams said. See other budget reductions here. Editor’s note: This article was updated to include information about some of the budget reductions ultimately being paid for by fiscal year 2017 fund balance. Anyone taking bets on how much of this bloated budget will not even be spent? My over/under line is about $30M. P.S. Did anybody hear that the Loudoun County Circuit Court appointed another special prosecutor to investigate possible criminal acts by the multiple school board members in March 2017? Neither did I until recently. Apparently neither the school board or the Commonwealth’s Attorney feel it necessary to inform the public about criminal investigations into this school board’s behavior. Funny how Plowman ran to tell everyone about the frivolous investigations into Sheriff Chapman and Chair York right before the election. School board members should be pro-public schools. Most of them want to dismantle it like DeVos!